We recently shared a few of our favorite foods under $10 in and around Los Angeles — and then we asked the BuzzFeed Community to share theirs. Here’s what they said. 1. A French dip sandwich at Philippe The Original. 2. The rice bowl — with sorrel pesto, radish, feta cheese, and poached egg — at SQIRL. 3. A slice of maple custard from The Pie Hole. 4. Dynamite Fries at Oi Asian Fusion. 5. Macarons from â€˜Lette Macarons. 6. The fried chicken biscuit with Sriracha honey and egg from Free Range food truck. Where: Local rotating schedule found here. 7. A dozen cheese pastries from Porto’s Bakery. 8. Carne asada and al pastor tacos from King Taco. 9. Warm croissant bread pudding at Masa of Echo Park. 10. Dollar Filipino street food and melon juice at Dollar Hits. 11. Popcorn bacon — deep fried chunks of bacon with maple crema — from Black Hogg. 12. Dole whip soft serve at Brian’s Shave Ice. 13. Thai boat noodles at Sapp Coffee Shop. 14. Specialty donuts — like maple bacon or Fruity Pebbles — at California Donuts. 15. Dollar tacos from El Chato taco truck. 16. A scoop of saffron pistachio at Saffron & Rose Ice Cream. 17. The Scott Baioli dog — smoked bacon, cheese, caramelized onions, and garlic aioli — at DogHaus. 18. A bowl of Daikoko ramen at Daikokuya. 19. Cheese pupusas at Sarita’s Pupuseria. 20. The Spanish Godfather sandwich — ham, tomato, chorizo, manchego, and veggies — at Ink Sack. 21. Red velvet cake at Doughboys. 22. Steamed buns and duck fat fries from The Bun Truck. 23. 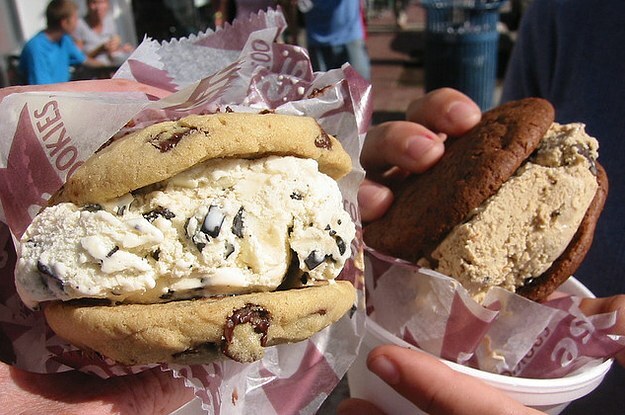 An ice cream and cookie sandwich from Diddy Riese.